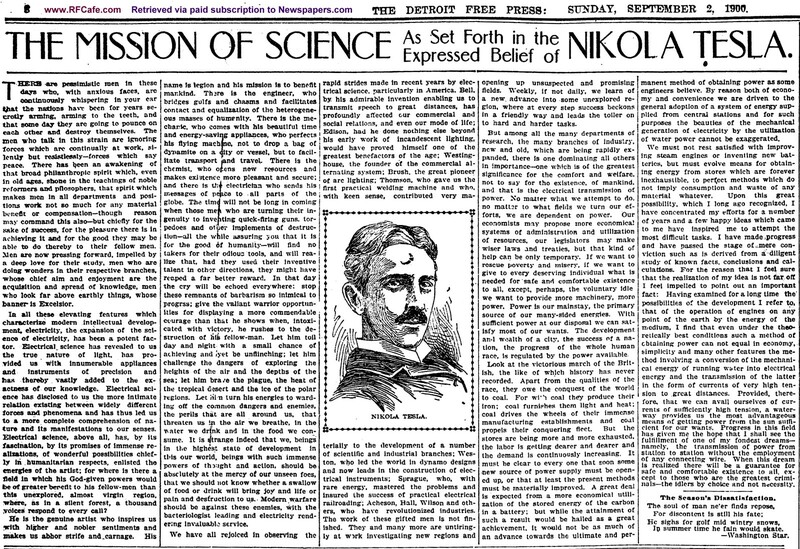 "The Mission of Science As Set Forth in the Expressed Belief of Nikola Tesla" - The Detroit Free Press, September 2, 1900. "Boyhood Days of Nikola Tesla" - The Boston Post, September 6, 1896. "The Electric Fiend" - The Pittsburgh Dispatch, July 1, 1889. Nikola Tesla. "Strangest Man in New York - Nikola Tesla and His Perpetual Motion Machine" - The Salt Lake City Herald, June 27, 1897. Nikola Tesla was born in 1856 in Smiljan, Austrian Empire (modern-day Croatia), and died in 1943 (aged 86) in New York City. His life is so amply documented far and wide that regurgitating the information in books and blog posts would be a waste. Most of what you find there is second-hand, having gone through the filter of an author's preferences. I like to search for stories on various topics in their original publications; e.g., scanned newspaper and magazine archives. A hunt for early stories on Nikola Tesla turned up many 19th century examples from the Newspapers.com website (subscription required). It is interesting that back in the day, men like Tesla and Edison were regularly referred to as "electricians." The oldest article I found on Nikola Tesla appeared in the July 1, 1889 edition of The Pittsburgh Dispatch, titled "The Electric Fiend." Included is a rather ghoulish, detailed description of the electrocution death of an "electrical expert." To wit, "The right eye was burst by the bolt, leaving only a white ball protruding from the socket." Ick! Tesla (~33 years old at the time) was called in as an expert to analyze the situation. He mentions plans to institute capital punishment via electrocution and calls it "stupendous ignorance" if not administered properly - via a stroke of "artificial lightning" rather than the attachment of wires to the body. 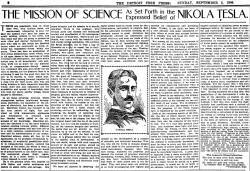 From the September 6, 1896 edition of The Boston Sunday Post we have an article that delves into the upbringing of Nikola tesla and the experiences that nurtured his love of science. The Famous Electrical Inventor Was Born in a Half Civilized Land. The Son of a Greek Clergyman. He Was a Studious Youth, But Full of Fun - Built a Flying Machine at 12 - His Education. In all probability Nikola Tesla knows more about electricity than any other man living. He stands at the head of those who, within the last twenty years, have done more to forge the bonds that have made the mystic current the useful slave of human kind. And yet Nikola Tesla's boyhood was mostly passed in a region where the people are hardly more than half civilized in their ways; a region over which Moslem and Christian have waged bloody combat for centuries; a region of rugged, bleak mountains and narrow valleys and impetuous, rushing torrents. This region is known as Montenegro; it is a narrow strip of country that lies between Austria and Turkey, and it takes its name from its own somber mountains. Nikola was born in the little village of Smiljan, province of Lika, less than forty years ago. His father was a clergyman of the Greek church, to which most Christians in Montenegro belong, and all through the boy's early years his most numerous acquaintances must have been among the rough peasants of the neighborhood, some of whom were poor beyond description and many of whom were so ignorant that they could not even read. But in spite of their lack of cultivation and of cash the peasant men and women of Montenegro are fine, strong folk, seeming to possess something of the ruggedness of their surroundings in their own persons. They are brave, too, and they love their country and their religion, and in his youth Nikola must have heard many tales of heroic deeds done by his father's friends and neighbors in self-defence against the Turks, who wished to rule the land and to force the people to change their faith. An American boy could hardly imagine anything more novel and strange than were this boy's surroundings. Every man in Montenegro knows now to handle the rifle and all other weapons, for he is likely to have need of them at almost any time, and every one is an expert fisherman and hunter. They dress in the brightest colors, and even the poorest often wear clothes that arc richly embroidered and otherwise ornamented. The women, too, attire themselves in what would here be considered fantastic garb, but, aside from what little farm work is done by the men, do nearly all the labor of the country. Sometimes the women do much of the outside work, even, and without compliant, for have not the men enough to do to attend to the fighting and the politics of the country, and the shooting of game? It is partly due to the attention given by the men to other things than work, and partly to the ruggedness or the region, that the people of Montenegro are so poor and so ignorant in the mass. Just how backward they are as to the comforts at life may be faintly hinted by the statement that in some parts of the country furthest removed from the larger towns, the bread is baked without yeast in the ashes of open fires, there being no ovens of any sort, nor even chimneys to carry off the smoke. The Montenegrins speak a language that would sound extremely queer to American boys. It is described by linguists as a pure "dialect of the Slavic," and is the nearest of all languages to the original Salvonic into which the Bible was translated nearly a thousand years ago, for the benefit of the peoples of Central Europe. But it must not be understood that all those who dwell in Montenegro are ignorant and uncultivated. As a people they are bright and quick and their sayings are often of striking force. For instance, in explaining the rocky nature of the soil, the Montenegrin will tell you that "When God was scattering stones over the earth a bag of them burst over Montenegro." Among their leaders, too, are many who are highly cultivated. Tesla's father being a priest, he was, of course, and educated man, and it was probably because he saw that his son could not do his best in Montenegro that the boy was sent away from home at thirteen. When only a little lad Nikola was very fond of study. Not altogether the study of books, but largely of things, for, like all healthy boys, he was interested in all that he saw about him. His earliest notion was that it was a pity that man should have to climb the hills with which his home was surrounded, since birds could fly wherever they wished to go, and with such small apparent effort. So, when only a little chap of twelve he set about making a flying machine, using an old umbrella for the foundation. Undoubtedly he had the same general ideas that were later adopted by Herr Lillienthal, the German who was killed the other day in one of his experiments, for like Lillienthal, young Tesla's plan was to start his flight by jumping from the top of a hill. His interest in flying died out, however, when he fell and was so badly hurt that he had to stay in bed for six weeks. It was while he was laid up by this accident that he began to study mathematics and mastered arithmetic. He had an idea then that all problems in the science of numbers could be solved by the proper use of the number three and its "powers," but whether he proved his theory he has never told. He had then been seven years in school, having spent three years in the Real Schule at Smiljan and four in the public school at Gospic, to which his father had removed. Gospic was a larger place than Smiljan, though only a very small town, but there were many more things there to interest him than there had been at Smiljan. His father decided, however, that the educational advantages of Gospic were not sufficient for his son, and so the lad was sent to live with his aunt in Carlstadt, Crotia, where he was to finish his schooling. It was while on his way to Carlstadt that the lad saw a steam engine for the first time, and it filled him with the greatest delight. It was then, too, that he determined not to be a clergyman like his father, as the latter wished, but to devote himself to science; and he studied so hard at Carlstadt that he was able to finish a four years' course in three years' time and to graduate in 1873, when he was only sixteen years old. Then there was an epidemic of cholera and because of this he returned to his father's home at Gospic. But the disease sought him out and when he recovered, he was so weak, that for two years he remained at home and rested from his studies. It was while he was at home then, that he managed to get his father to agree to a scientific career. When the boy was eighteen he was sent to Gratz, in Austria, to study for a professorship in mathematics and physics. At Gratz he saw, for the first time, a Gramme electrical machine, though he had previously made some boyish experiments with electricity, having constructed with his own hands a rude little generator which he operated with the power of a toy water wheel. As soon as he saw the Gramme machine he determined to make electricity his life study. That was in 1875, only twenty-one years ago, adn in that time Nikola Tesla has wrought more marvels with the agency that is now used to light our streets and houses and factories, haul our street cars and do so many other wonderful things, than any other person, - unless it be Edison, who was then a telegraph operator and not far from the beginning of his career as an electrical inventor. It should not be understood that young Tesla missed any fun that was going, just because he was forward in his studies. On the contrary he was always full of juvenile tricks, and had many boyish adventures as he himself has often declared. Once he went by himself to a little Chapel away up in the bills back of Gospic, and in some way was locked in for hours. In the meantime he was missed by his father, who organized a searching party, but of course never thought of looking for the boy in the right place. How long he might have remained there no one knows, had he not finally thought of ringing the Chapel bell. Loud and clear through the narrow valley echoed the sound as he pulled the rope, and, guided thereby, the searchers hastened to the Chapel, not at all sure, however, that the boy was there. When found he was cold and hungry and nervous, and glad to get back home to his mother,. It was his mother who sympathized most with his aspirations, and it was largely her influence over his father that finally won the latter to the boy's plan not to be a clergyman; and yet she must sometimes have been annoyed by his pranks, Once, as he occasionally relates to his intimate friends, he was so startled by her sudden appearance on the scene when he was up to some piece of mischief that he fell into a great kettle of fresh milk, spoiling the milk and his clothes at the same time. She was a woman of unusual ability, force of character and ingenuity. The latter characteristic was mostly developed in her embroidery, which was of artistic and original designs, and made her famous all through the part of Montenegro in which she lived. To his mother's love and influence Tesla attributes much of his manhood's success. It should be said of the man whose boyhood has been outlined above and whose success has been so great, that although his inventions have yielded him a great deal of money, he has spent it in making new investigations about as fast as he has received it, and that he regards the benefit to humanity that scientific progress will insure, as of far greater importance than mere money making. Once when he was talking with the writer of this article, Nicola Tesla declared that he believed the mission of applied electricity to be the practical rejuvenation of the world, by lessening the amount of labor that must be performed by human hands, and that he hoped to live to see the day when all alike, both rich and poor, should share equally in the advantages of all scientific discoveries. "But that would be practically the abolition of poverty and riches," the Writer ventured to say. "Precisely so, answered Tesla, "and that is what I believe will bye and bye be accomplished by man's investigation and utilization of nature's mysteries.